The United Launch Alliance Delta IV Heavy rocket carrying NASA’s Parker Solar Probe rolls out at Cape Canaveral Air Force Station in Florida on Aug. 10, 2018, ahead of a planned Aug. 11 launch. CAPE CANAVERAL, Fla. — NASA's historic mission to touch the sun is nearly ready to lift off. A view of the Delta IV Heavy from the other side, showing the Parker Solar Probe logo. The heavily shielded Parker Solar Probe will make 24 such close flybys over the next seven years, getting within just 3.83 million miles (6.16 million kilometers) of the sun's surface at closest approach. 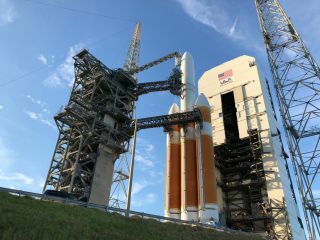 The sun's gravity will accelerate the spacecraft to record-breaking speeds during such encounters; at its fastest, the Parker Solar Probe will go about 430,000 mph (690,000 km/h), NASA officials said.